Spinach, or Spinacia oleracea, is one of the most nutritious vegetables found in the grocery store. Normally packaged in a clear plastic container, most spinach leaves are exposed to fluorescent supermarket lights for up to 24 hours a day. Surprisingly, a study published in March in the Journal of Agricultural and Food Chemistry shows that the light exposure boosts the vegetable’s nutritional content to astonishing levels. Scientists at the Kika de la Garza Subtropical Agricultural Research Center and the Atlantic Food and Horticulture Research Centre conducted an experiment to test the affect of lighting on the nutritional value of spinach. They exposed spinach to either continuous light or darkness while under simulated supermarket storage conditions for up to 9 days. Even spinach leaves exposed to the fluorescent lighting for only three days showed significant increases in important vitamins and antioxidants. The leaves exposed to nine days of light had increased folate levels by 84-100% and levels of vitamin K between 50-100%. Even further, the group exposed to no light had declining nutritional values. The most exciting implication of these results is that other vegetables may receive the same benefits from fluorescent lighting. Keeping vegetables fresh in grocery stores is a constant struggle, and additional studies may illuminate more effective storage solutions. One serving of spinach currently provides 20% of your daily recommendation for vitamins C, A, B9, K, and E but with further research soon you may be getting more bang for your nutritional buck! Want fresh veggies? Let there be light! The fungus Muscodor albus rarely gets to play the hero-but that could all be changing according to USDA Agricultural Research Service (ARS) scientists. In February 2010, results from an ARS study regarding the effects of this fungus on a common wheat disease were published in The Canadian Journal of Microbiology. Throughout multiple experiments in recent years, researchers have found that Muscodor albus was effective in eliminating common insect and fungus pests that attack wheat, apples, and grapes. This natural fungus could be the answer to eradicating numerous agricultural pests. But how does this fungus do it? Instead of physical strength, or even the ability to fly like other superheroes, this fungus emits Volatile Organic Compounds (VOCs) that are known to naturally kill pests and other fungi. The most recent Muscodor experiment tested the fungus’ ability to eliminate another fungus T. tritici, which reduces wheat yield and lowers crop quality. In laboratory experiments, the VOCs from Muscador killed 100% of the T. tritici spores and prevented the spread of the fungus. This is just one of numerous experiments regarding Muscodor albus-results show that this fungus is also effective against agricultural villains like potato tuber moths, apple codling moths, and the fungus Botrytis cinerea. from "Fungal Fumes Clear Out Crop Pests" in the February 2010 issue of Agrictultural Research magazine. 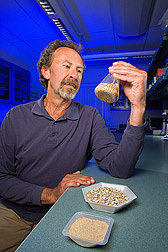 Blair Goates, plant pathologist, examines wheat seed after applying a formulation of the biocontrol fungus Muscodor albus, shown in the foreground. Fungi such as T. tritici are currently controlled in the field by chemical pesticides, which are effective-for now. Researchers are interested in biocontrol solutions because it is possible that these agricultural scoundrels will become resistant to the chemical pesticides. This could expose growers to tremendous financial losses because they have “become reliant” on chemical solutions, according to plant pathologist Blair J. Goates, with the ARS Small Grains and Potato Germplasm Research Unit. And while chemical effects on humans and the environment are a constant concern with chemical pesticides, the use of Muscodor albus does not harm humans or animals and leaves little residue on treated plants. This biocontrol could also benefit organic growers, because currently there is no available natural treatment for these extremely common pests. While Muscodor albus doesn’t fight crime, it may progress as a useful biocontrol method for a different kind of villain. Don’t expect this fungus to wear or cape, or even to star in a comic book, but you can expect Muscodor albus to continue making headlines as a potentially powerful biocontrol agent.